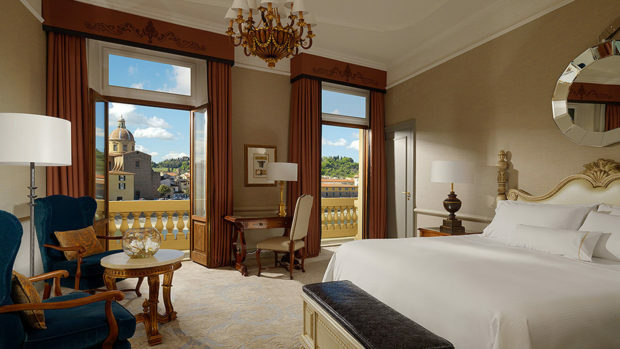 Elegance in Florence really doesn’t more proudly along the Arno River than the formidable duo that is the Westin Excelsior Florence and her sister property the St Regis. Many of the luxurious rooms and suites here overlook the river of course and the Oltrarno area, with the famed Ponte Vecchio just 900 metres away and the Duomo a short 15 minute walk. With 171 guest rooms and suites, the gourmet Se.Sto on Arno restaurant and bar, and 360 degree rooftop views of the city, this Florence institution is 5 star style at its very best. 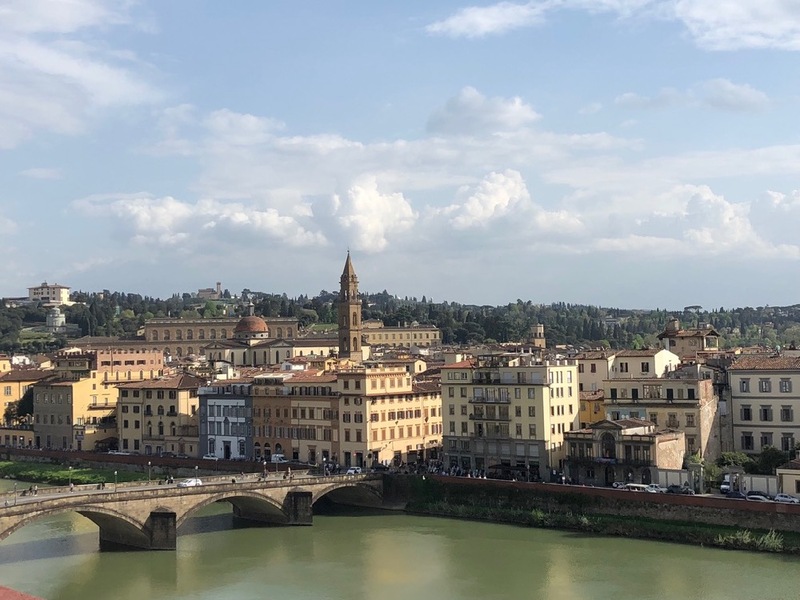 Located in Piazza Ognissanti along the Arno River, the Westin is perfectly located with Florence at its doorstep but without the crowds of the Duomo area. All of the major attractions including the Duomo, Uffizi Gallery and Pontevecchio can be reached easily within a 10-15 minute walk. Florence airport is a 25 minute drive and the central train station, Santa Maria Novella is 5 minutes away by car or 10 by foot. 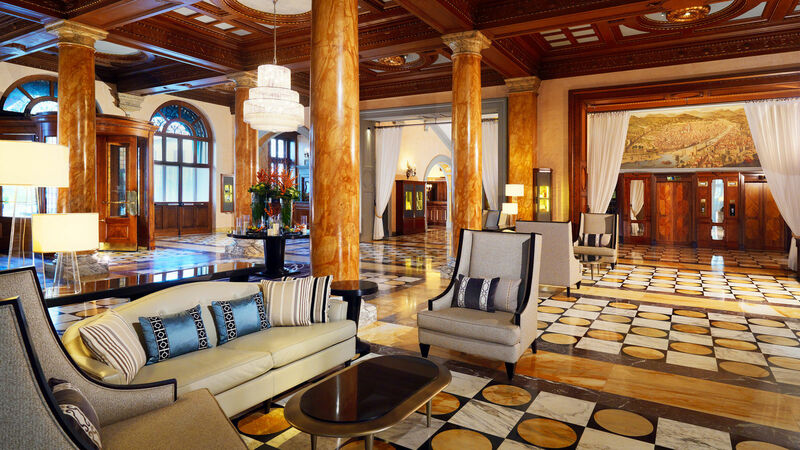 The Westin Excelsior is housed within a stunning renaissance palace. While recent upgrades have given it a chic and contemporary touch, this historic period style can still be felt throughout. In fact, it’s a perfect blend of style and design where each of the (171) guest rooms and suites are appointed in period style with a touch of Florentine design flair. The mix of fabrics, colour, wooden panels and flooring in the rooms offer a warmth that is not always guaranteed in big hotels. Rooms and suites are set across 5 floors with the 6th floor dedicated to the Se.Sto restaurant and bar and unrivaled views of the city. Check in is available from 3pm and is handled in a swift and friendly way. Thanks to the bell desk service on arrival, bags causally reappear in your room once you have time to settle in. I stayed in an elegant Penthouse Suite with chic Florentine decor features including a decorative mirror wall feature, king bed (the Westin Heavenly Bed with designer sheets and down blankets). My suites had a 10 square metre terra-cotta tiled terrace with panoramic view of the Arno River and bridges and rooftops of Florence. The living area was decked out in contemporary and decadent green armchairs, a desk and desk chair and the glass chandelier and artwork gave the room a classic touch. The bathroom had floor to ceiling marble interiors, plush towels, robe and slippers and the signature Westin White Tea cosmetic amenities. Each of the rooms here feature 42 inch flatscreen TVs, heating, air conditioning, mini bar and WiFi and room service is available too. Food and beverage at Westin properties is all about treating yet looking after guests from and health and well-being standpoint. Hence their Eat Well Kids menus and in-room Westin Sleep Well menu with a range of superfoods and ingredients that will prepare you for a good night’s rest. The Art Deco Orvm Bar in the lobby is great for all day snacks, light meals or a cocktail and then there is the jewel in their crown – Se.Sto on Arno. 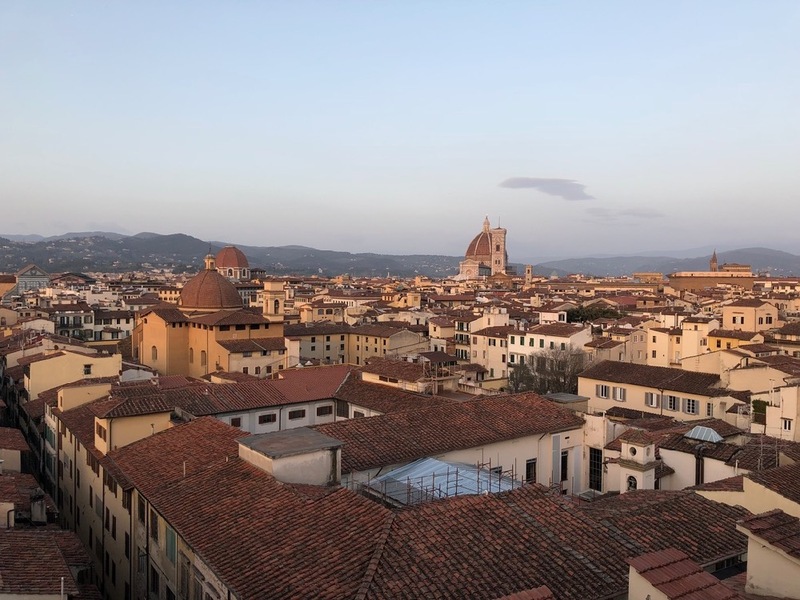 Rooftop bar and restaurant views in Florence don’t really get much better than this in that we are talking a 360 degree panoramic feast for the eyes! From the famous Duomo to the iconic Pontevecchio, foreigners and Florentines alike mix here at aperitivo hour which is a luscious spread of regional delights. The floor to ceiling glass means that even from inside the restaurant, your dinner or cocktail comes with a view. Young and award winning chef Matteo Lorenzini from Siena, serves up regional and local dishes from homemade pasta to risotto to fish and meat. Vegetarian options are available as is a gourmet tasting menu at dinner. Guests at the Westin are truly spoilt with dining choice in that sister property, the St Regis is across the square (Piazza Ognissanti) and boasts the Winter Garden by Caino restaurant with one Michelin Star. Enjoy the Westin’s epicurean breakfast delights on the ground floor in the Caminetto dining room from 7 to 11am. The buffet spread is all you would come to expect from a 5 star hotel with an expansive selection of local and international dishes. Everything from Italian cheese and charcuterie to cereals and fresh fruit, eggs anyway you want them and pancakes. The Westin’s partnership with The Juicery means fresh juice mixes are available to your hearts content and there is also an ample offering of sweets and freshly baked pastries. A continental and a-la-carte breakfast is also available via room service. 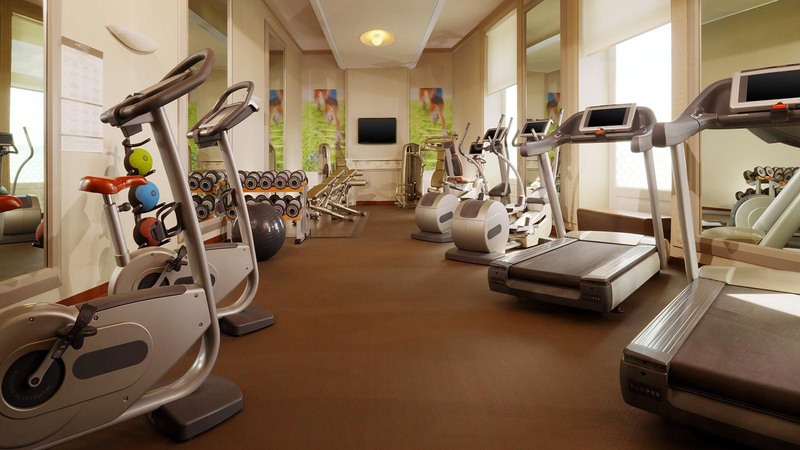 The hotel is equipped with a WestinWORKOUT Fitness Studio with Technogym facilities. Complimentary for all guests, it is accessible 24/7 with your room key. Training gear is available on request so you can pack lightly! Guests are also welcome to utilise the Iridium Suites Spa by Clarins at the St Regis who offer a range of facial and body treatments. It is open Monday to Saturday from 1-9pm. Not only are the concierge staff knowledgeable and friendly, they will work to make your stay everything you need or dream of. From restaurant bookings to helping you select a tour of the city that’s right for you, they are on hand 24/7 to Asia with any of your needs. Classic Double rooms start at £590 (€680). Breakfast and free wifi is included. The room featured here is the Penthouse Double priced at £1440 (€1650) and boasts a large private terrace overlooking Florence and the Arno River, minibar, breakfast and wifi.